What happens when one Siamese twin dies before the other? When was the first breast augmentation done? Find out the answers to these questions and more at the reopening of Bodies: The Exhibition at South Street Seaport. 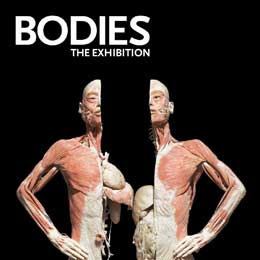 The Bodies exhibit, featuring human specimens and the systems and parts thereof, has become a staple at Pier 17 since 2005. After closing in January for renovations, the exhibit reopens today with a $20 admission offer (thru 2/20) and hosts all new multi-media and interactive galleries as well as 130 new-to-New York specimens.